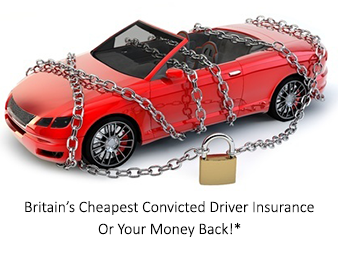 One Sure Insurance is a specialist car insurance broker with access to private car schemes for convicted drivers. We are able to cover the majority of convictions and are often able to shop the market and secure affordable car insurance policies for you. We can even cover serious offences such as Drink Driving, and Driving while Uninsured - and can offer discounts for good driving (such as no claims bonus) where applicable. Our team of trained specialist advisers understand the complexities of each conviction - and we work with you to obtain the cheapest car insurance policy possible. We are often able to work directly with the underwriters to explain unique circumstances, which gives you preferential rates. As a broker, we pride ourselves on securing the absolute cheapest insurance guaranteed* for our clients. Whatever your circumstances, we can refer your individual risk to underwriters for a manual quote - giving you a personalised and tailor-made quote suited to your circumstances. We live and breathe our company motto - "Britain's Cheapest Or Your Money Back*". As a client of One Sure Insurance, you'll benefit from our industry leading price promise. If you manage to find a cheaper like-for-like quotation, then we'll issue you with a 100% refund on the price you paid. That's how confident we are in our convicted driver car insurance. Ready to save? Give us a call today! We can get quotes from both brokers and direct car insurance providers. We can shop the market and access specialist convicted insurance schemes that other brokers can't. Our trained specialist sales advisers will work with you to put together a tailor made quotation. We have access to schemes and policies that aren't available to the general public. Pay in full, or over affordable monthly installments - you decide! We've been in business for just over 10-years, and like to believe that we deliver an unrivaled level of service to our clients. We pride ourselves on our high standards of customer service, and after-sales support. We have built systems to make your life easier - such as our customer self service centre - giving you peace of mind that your documents have been securely sent to us and processed. Our customers think we're doing a pretty good job too - just read our reviews on Reviews.co.uk to find out more.